When you think of Transformers, odds are that the first bot you think of is Optimus Prime. Noble, brave, selfless, and completely devoted to the protection of all sentient life, Optimus helms the heroic Autobots of Cybertron in their ongoing fight against their ancient foe, the malevolent Decepticons—who in turn are led by Optimus’s polar opposite, Megatron. Long before the war came to Earth or raged on Cybertron, Optimus was Orion Pax, a simple archivist/librarian in the great Hall of Records in Iacon, Cybertron’s Autobot capital. During his years of service, he became friends with a gladiator named Megatron, who shared his hopes and ideas for a united, equalized Cybertron. As Megatron gained popularity and standing, amassing a host of loyal followers, his views began to show their true colors: tinged with violence and cruelty. When Megatron finally stood before Cybertron’s High Council to argue his case for unity and equality, he was arrogant and combative, demanding to be made the next Prime. Orion was also present, and he answered Megatron’s haughty speech with impassioned words of peace, fairness and mercy for all Cybertronians. The Council was moved by his words, and as one they chose to give the Primes’ inheritance—the Matrix of Leadership—to Orion, and he became Optimus Prime, last of the Primes. Even though he is the supreme commander of all Autobot forces, Optimus is still at his heart the gentle, pacifist librarian, and every fallen Cybertronian—both Autobot and Decepticon—weighs heavily on him. Many of us have no doubt seen Michael Bay’s Transformers movies, and much as I love and respect the great Peter Cullen—who voices Optimus—I am forced to agree with the many Transfans who say that the Optimus of those movies is not the one we know and love. 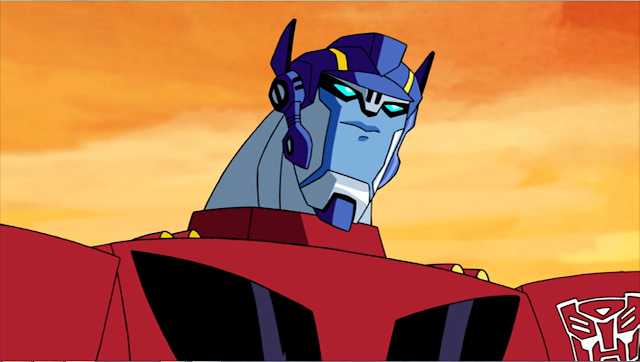 I myself believe that a closer bot to the Prime of lore is the Optimus Prime of the 2007 Transformers: Animated TV show. Let me explain why. 2. He protects his own. His team isn’t just bots he works with. They’re his family. Not only does he protect them fiercely with every line of code in his being, he is a constant presence of comfort; despite his youth and inexperience, he always leads from the front and by example and always offers a sympathetic ear whenever they have need. When they crash on Earth mere miles from downtown Detroit, they’re essentially marooned and cut off from Cybertron and their fellow Autobots. More than anything else, this brings them all together. Well…when the story starts, we get the feeling that Optimus is still very much the typical Academy-bot, annoyed when regulations aren’t followed, ready with rally-words about working together (and cogs in the great Autobot machine…) and stern when his orders aren’t obeyed. But spending time with both his Autobot and Earth teammates brings out the innate kindness in him, along with the kind of charismatic and effortless leadership that you would follow to the ends of the earth. Now he’s not so much annoyed that his orders weren’t followed as concerned that his fellow-bots could have gotten themselves hurt because they didn’t follow his orders. But as for the speeches…I got nothin’. 3. He’s completely devoted to protecting all sentient life. All Autobots are sworn to the protection of life…and arguably none take this more seriously than Optimus. When his team captures enemy Decepticons, they are not executed but subdued and held until they can stand trial. And when they encounter human evildoers on Earth, they are not harmed either. During their stint as Detroit’s newly anointed superheroes, Optimus and his bots have many run-ins with humans who would be well-fitted to joining the Decepticon ranks. But even then, no matter what these human criminals have done, Optimus treats them with as much care and gentleness as any other human he comes into contact with. One such human is the Angry Archer—a Robin Hood-esque villain with almost as many gadgets as Batman. When Optimus encounters him one night in Detroit, he holsters much of his more dangerous tools and uses only his bolas and hands to capture him. During one of their many battles, Optimus gains the upper hand over Megatron, and the Decepticon leader says, “What are you waiting for, Autobot? Finish me.” For a moment…I feared he would. But Optimus only smashes Megatron’s arm-mounted fusion cannon and slaps stasis cuffs on him, saying, “That would be the easy way out, Megatron. You don’t deserve it.” If that isn’t being faithful to your morals, I don’t know what is. Out of respect to Peter Cullen, I will not condemn the live-action Transformers movies here. But one of the things they sorely miss is the Optimus who is mindful of his humble origins, fiercely protective of his own---bots and humans---and unyieldingly true to his own code. So what if this one’s animated? I’ll take it. It’s a good show, and this Optimus is witty, human, easy to relate to, and he’s won himself a very dear place in my heart. It doesn’t hurt either that he’s voiced by the talented and versatile David Kaye. And…he carries a wicked axe. Who is (are) your favourite Optimus Prime(s)? Why? Show your love for our boss bot!